Improve Swimming Speed Part 2 | Mediterra - Swim & Run Better Than Ever! Let’s say you want to go a bit faster than you can now, to improve swimming speed, but your current methods are not working. In TI we teach you that Stroke Length and Stroke Rate are results of skill – or in other words, a result of power applied through technique. I will repeat the principle I mention often: fitness is your ability to generate power, technique is your ability to deliver that power where it is needed. You can be wonderfully fit, but really swim nowhere fast – as so many swim-struggling triathletes can attest to. And on the other extreme there are those swimmers who swim so stinking fast without appearing to apply much effort. This principle explains both, and every result in between. The swimmer with superior technique requires far less power to get the job done than one with poor technique. How powerful a person is means nothing without the technique to put it to good use in the water. Here is the fact that is ignored to one’s detriment: You cannot separate technique training from power training. They may be separated in your imagination, but they are inseparable in your neuro-muscular system. All repetitive movement is ‘technique’ training – the question is: is that repetitive movement training patterns into your neuro-muscular system that will apply power effectively or apply it wastefully? In the Total Immersion training method we recognize and exploit the fact that in proper technique training, power-training is built into it inseparably. However, this series of essays is meant to confront those who maintain a ‘power-training is separate from technique-training’ mindset which is, for whatever strange reason, the default human bias when it comes to swim training. (Ever been handed a pull-buoy or kick-board by a swim coach? My point exactly.) This bias might come in two contrasting forms of swimmers: those who emphasize power-training with low regard for technique (in the act of power-training), and those who are misguidedly focused on ‘technique-training’ without regard for power. Both are erroneous because they are based on the wrong assumption. Neither will allow you to come close to your speed potential however dedicated you are to your process. But once the two dimensions of training are merged in the mind and practices are designed around it improvement in speed becomes not only possible, but common. So now let’s look at the speed equation in terms of those skills behind SL and SR.
We said earlier that Speed = Stroke Length x Stroke Rate. Those two speed variables (SL and SR) are products of power applied through skill: The higher the technical skill, the less power required, and vice versa- the lower the technical skill, the more power required. Further lowering power-demand with complete trust in the properties of water and the natural forces to do what they can do for you so you don’t have to do it. But these are not just a jumble of skills thrown in a pot and randomly stirred together. They are interwoven, in a certain sequence of foundation-and-dependency. In the diagram you can see how I have stacked them in order of priority and shown magnitude of importance on this pyramid – the bottom being the foundation, and each subsequent stratum supporting the one above it. Your stroke timing skills are dependent upon your body shaping skills. Your body shaping skills are dependent on your body alignment skills. Your body alignment skills are dependent on your trust in the water. If the foundation is poor you’re going to need an extraordinary amount of extra power to make up for it. And that is expensive and exhausting for any human. For anyone reading this who experiences premature exhaustion you most certainly have some gaps in your foundation levels. Since this is such a popular struggle point for humans let’s use the common example of breathing struggle and I will break it down and trace the problem to its probably root cause. The swimmer does not trust the water to support him fully. Whew! I got exhausted just thinking about that while writing it! Does that sound like the current or former experience of anyone reading this essay? The good news – none of this is necessary. Total Immersion has the tools to correct all of it. The sobering news – if you are reading this, you are likely among those of us who were not naturally gifted at swimming smooth and fast. So, all of this is going to take some time and effort to correct. You are a human, after all. The human swimmer will reach no perfection in any of these skill stratum – but we can get really close through a good process (reference Part 1). There can be continual, cyclical progress toward it, day after day, year after year – with thrilling bumps up to the next level of ease and bursts of speed capabilities periodically along the way. (You may look this essay which discusses the Mastery Process). And from this process you will reach a marvelous state of swimming skill, far better than the vast majority of humans that swim regularly, far better than those you might compete with as an adult in serious races. You will work through these stratum in sequence. Work to a level of capability then move on. Go through this process many times over the course of your swimming life-span. Each time through go a bit deeper in detail, refining skills in each stratum further. Consider a sculptor working on a massive and intricate piece, he will rough in the dimensions of the piece on the first time through. Then he will go through a second time with a finer tool. And so on, and so on, with finer and finer tools until his last times through the process are ‘polishing’ off the most intricate details. You are shaping your swimming vessel (body and mind) in layers. You start with a rough chiseling pass over the piece, then take a moderate chiseling pass, then an fine chiseling pass, then a finer chiseling pass, and so on until you come to a polishing phase. Then your incredible capabilities bring you to a vista where you discover a new realm of possibility, pick a new project and start the sculpting process again – more eagerly than before because now you know the process well and are more confident in it. #1 – Don’t get stuck on seeking perfection in just one part, out of balance with the others. Work on a full range of interdependent skills. Address your weaknesses aggressively. Develop the skills together and then use that evenly-skilled platform to move up in the process. #2 – Recognize and work on the dependent skills to make it easier to work on the advanced skills. Work on the skills in order, from foundational skills to advanced dependent skills. #3 – Training is not a one-time-through-to-perfection process. You won’t perfect your balance on the first time through the process. Rather, your skill-building life is cyclical. You work through the process many, many times, each trip through you go deeper in sensitivity, recognize finer details, demanding higher attention, higher quality from yourself each time. #4 – If you find you are getting bored you are in need of more challenge – add a bit, or move forward in the process. If you are failing too often and getting frustrated, you’ve tried to jump too far forward too fast. You will learn the art of keeping practice in the optimal challenge zone just right for you, not too much and not too little. #5 – In light of that, don’t be afraid of adding some power to challenge your technique – risk causing some failure in your technique and learn from it. 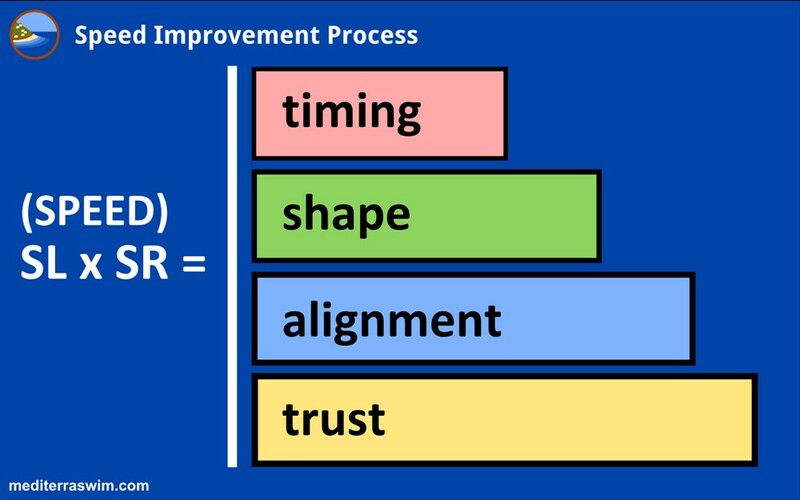 This is essential to the speed improvement process. Adding power means your heart rate is going to go up, your respiration is going to increase, and changes (uncomfortable but healthy) will occur and this is all a good and necessary thing. #6 – And don’t be impatient either – don’t let external pressures (other people’s expectations, a race deadline, etc) push you ahead of your learning curve. Enjoy the process and stay in the present moment. Respect and nurture your own body and mind. The long term result is much better. Thank you Vick, for letting me know it is helping. It is my passion to see people thrive in their swimming and beyond. Please let me know when you have questions or if some explanation I give seems to leave a gap.